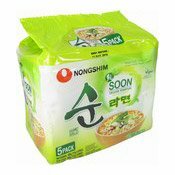 Ingredients: Noodles: Wheat Flour (USA), Palm Oil, Potato Starch, Modified Potato Starch, Salt, Acidity Regulators (E501, E339, E500), Seasoning (Yeast Extract, Soy Sauce, Garlic), Tocopherol Liquid (Antioxidant (E306), Emulsifier (Soy Lecithin)), Green Tea Extract (Oligosaccharides, Green Tea Extract, Acid (E330)), Colour (E101). Soup Powder: Seasoning (Hydrolysed Vegetable Protein (Soy), Maltodextrin, Yeast Extract, Salt, Soy Sauce (Soybean, Sugar, Wheat Flour), Spices (Maltodextrin, Garlic, Red Pepper, Salt, Black Pepper, Ginger, Onion, Green Onion), Salt, Sugar, Flavour Enhancers (E631, E627), Maltodextrin, Shiitake Mushroom, Acid (E330). Vegetable Flakes: Dried Choy Sum, Dried Carrot. Simply enter your details below and we will send you an e-mail when “Instant Noodles Multipack Soon Veggie Ramyun Noodle Soup (農心素食麵)” is back in stock!